Reagan slept well again last night. She went to bed around 9pm and I kept thinking, that's too early, there's no way she'll sleep through the night. But she did! She woke up around 7:30am this morning. I took her in for feeding therapy today. She has always been a poor eater so we thought it might be smart to get back into feeding therapy as we try to introduce solids again. It' s a lot of trial and error. Trying to find something she actually likes. She seems to like yogurt more than anything I've tried so far, so now I'm just trying to think of ways to thicken it up a bit because it's so thin, most of it flows right back out of her mouth!! She also had PT this afternoon. I did take the video camera, but it's not her best work (I think I'll try it again on Thursday to see if I get some better action). She's just been in a really cranky mood today. She's just not feeling well (and she had quite a few seizures today). She's still coughing a lot and sneezing too. Poor thing. I called the pediatrician today to see if I should bring her in and she decided to just call in an antibiotic for her. Great, one more medicine I have to force down her. It's beginning to get ridiculous. She's got her two seizure medications that she has to take 2x day everyday. I have to give her 5g of Miralax everyday in one of her bottles to keep her regular and I try Mylecon usually once a day for gas. She's down to one eye drop, 4x day. I'm also giving her Triminic at least 2-3 times a day for her cough, the occasional tylenol to ward off fevers, and now antibiotic 2x day for 10 days! I feel like all I do is attempt to feed her and stuff medicine down her throat!!! No wonder she doesn't want to eat!!! We've got another busy day of therapy tomorrow so I sure hope she starts feeling better!! I know I would hate to have to do therapy if I were sick!! Please keep her in your prayers!! 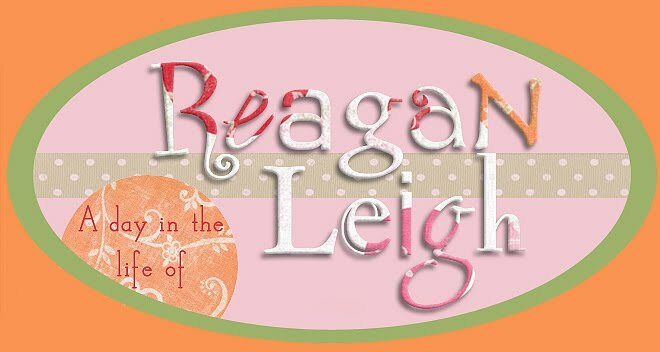 Meghan, Jackson's mom, inspired me to change the background on Reagan's blog. I've been seeing these cute backgrounds on a lot of blogs and they were all from the same place the cutest blog on the block. So I finally caved and changed it. I think it's pretty cute. A little busy, but cute (let me know what you think). Last night was a good night. Reagan slept through the night!! I don't know how because she's still coughing a lot, but I'm sure the rest was good for her. She woke up in a good mood this morning, so that's good for everyone. I took her in today for her 1 week post-op check up. The doctor said her eye looks good. No sign of infection and she has a good red reflex (her left eye is completely clear). She did say that the red reflex in her right eye is not as good as it was before and that it's possible that she's developing what they call a secondary cataract in that eye (which at some point may need to be fixed). Cataracts form on the lens of the eye and during the surgery they remove the lens and put in a lens implant (so technically they can never get another real cataract again). But sometimes during the healing process overproliferation of scar tissue can cause a cloudiness that mimics the effects of the cataract. The doctor said that this would probably be a one time thing. If they have to go back in and clear that out, there is a low chance of it happening again. She just wants to keep an eye on it for now and we'll see what happens. I'm not at all thrilled about the fact that she might have to have yet another eye surgery. Although she said that this one would be more simple and less invasive as the original surgery. Nevertheless. Reagan was good most of the day. She took a long nap this afternoon but she woke up on the wrong side of the swing. She was having tummy pains and some more intense seizures. Poor thing. She finally just cried herself to sleep. I'm not sure if she's down for good or not, so I should probably try to get some rest while I can. Please continue to keep her in your prayers...that she gets over this cold (or whatever it is she has) and starts feeling better and that these seizures ease up on her!! I just wanted to ask everyone to add little Jackson to their prayer list. Jackson is the little boy that did the HBOT the same time as Reagan. He is having brain surgery this week and he and his family could really use some prayers. It's a complicated, stressful process...Tuesday he is having a grid placed on his brain and they will monitor his seizure activity until Friday to determine the exact area where his seizures are originating. On Friday they will remove that portion of his brain and hopefully stop his seizures for good. They have had to travel to Detroit for this surgery and they are going to be away from home for 3 weeks while he recovers. Please keep this family in your prayers. Here is a link to his blog so you can follow his progress through the week. Last night was similar to the night before (unfortunately). Reagan was up a lot and unhappy. She just couldn't seem to stop coughing and get comfortable. But she woke up this morning happy once again. Not quite as smiley as yesterday but content. We've got a busy week this week, so I sure hope she gets to feeling well soon. We're going back into therapy full force this week, with 1-2 sessions a day. She also has her 1 week post op appt tomorrow for her eye and on Friday she's supposed to have an ABR hearing test, just as a check to make sure her hearing is OK. The only problem is that it has to be administered while she's sleeping (I know, sounds weird for a hearing test), so if she doesn't fall asleep they have to sedate her and they cannot sedate her if she's had any sort of breathing issues (ie cough/congestion). So I guess we'll just play it by ear (no pun intended) and see how she's doing on Friday. I really don't want to cancel this since we've had this scheduled for a while. Please keep her in your prayers this week for a quick recovery from this yuck and more importantly less seizures! The cough definitely got worse last night...Reagan was up and down all night long. Actually we were up and down all night long! She would cough and start crying, we would jump up and run over to get her, then she'd go back to sleep. You could just tell she felt miserable. Her tummy was also giving her problems, so it was double trouble. Poor thing. You would think she'd wake up this morning completely miserable and worn out (like me)?? Nope! She has been in a wonderful mood all day long. You just couldn't stop her from smiling! I have no idea why she was so happy...she was still coughing up a storm! She's been beyond energetic! We basically had to force her to go to sleep this afternoon (we just put her in the swing and let her smile herself to sleep) because she had been up all day long without even the slightest nap! She slept for an hour and it was up again, happy as can be! She only took that one nap all day...I think that's the first time she's ever done that. Both of us were running a low grade fever this afternoon. I knew it was only a matter of time...she has a habit of coughing right in your face! I gave her some tylenol and some cough medicine (expectorant/nasal decongestant), so hopefully that will cover all bases. I do have to say that we've been extremely lucky...she has been the happiest sick baby I've ever seen (a complete turnaround from last night). Seizures have been the same as yesterday (knock on wood)...enough said. Please continue to keep her in your prayers! Hopefully she'll have a better night tonight! Smiling so much she could barely drink her bottle! Reagan has been waking up super early the last several mornings...between 5-6am. I'm especially not a morning person and this is really wiping me out (although I'm very thankful that she's still sleeping through the night). Today she also woke up with a cough. At first I just thought it was her choking on her spit because she's been especially spitty lately (and a lot of the time that is why she's choking), but there's definitely something behind this cough because it has persisted all day. Maybe she's getting sick. She actually doesn't get sick that often. Probably because she's rarely ever around other kids and she doesn't touch or put everything in her mouth like most kids do. That would just figure. She gets sick the first week she's back in therapy. Actually I think the exact same thing happened when she returned to therapy after being out while on ACTH. So many kids in one place, it's probably a breeding ground for germs! If she is in fact getting sick, that could explain the big seizures we've seen over the last couple days (it can lower their threshold for seizures). Although, she has had a better day today...no big ones (knock on wood). I finally heard from her neurologist tonight (he called pretty late...I thought he wasn't going to call). He wants to just stay put for now and see how she does over the next week or two (since we just took her off the diet). Then at that point we'll probably do another EEG and then see about adding another medication (topomax). I just hope we see improvement with lowering the vigabatrin dose because I don't know if I can handle two more weeks of bad seizures. Please continue to keep her in your prayers! Although it might not sound like it, today was in fact a better day. Reagan was in a great mood all day today. She had a really wonderful PT session where she was stepping and pushing her way across the entire room of her therapy center (in the walker...yes, I will take a video camera with me to the next session). Her PT is very excited about the changes she's seeing in her...and I'm excited that she's excited. Now when I ask for a better day maybe I should preface with what that means to me. I want to see less seizures and NO big ones. Unfortunately that wasn't how it all panned out today. Reagan had her fair share of spasms today as well as a big one (tonic-clonic) first thing this morning and then another tonight. I am at my wits end with these darn seizures! It's just so frustrating. I don't know what is going on. I don't think it was the diet but they did start up shortly after taking her off. I don't think it was the decrease in the vigabatrin. But who knows? It could be that her seizures are just evolving. Changing to a new type or adding another type. I hope not. I put a call in to her neurologist first thing this morning and never got a call back. Tomorrow someone is going to get an ear full from me. We are completely and totally helpless...it's a miserable feeling. I just want some relief for her! All I can do is pray. And I ask that you would do the same. Today has been a challenge. It started off with Mike opting out of going with us to Tx Children's this morning for Reagan's 24hr post-surgery checkup. I could have used the help, but someone in this family needs to work. So Reagan and I head out on our own and the traffic is horrendous! A lot of the stop lights are still not working in Houston and surrounding areas and I guess that's at the root of this problem. I guess. I tried to take a short cut because I was worried about being late for her appt and not only did I not gain any ground trafficwise, I ended up with a flat tire! I called Mike (crying) and he came quickly to change the tire. Meanwhile, as I stood on the side of the road with Reagan in hand a nice woman stopped to offer moral support and a good samaritan stopped and began changing my tire. After they finished changing out the tire, we got back on the road (and back in the traffic) and headed to her appt. We were late but they managed to work us back in. The doctor removed the eye patch (basically just ripping it off) and examined Reagan's eye. She said it looks great, a little red, but that's to be expected. So now we do eye drops every 2hrs! That's fun. While we were up at the hospital we also managed to get Reagan's hip x-ray done. We'll probably hear back from that doctor in a few days with the results from that. Reagan tolerated all of this fairly well and didn't get super cranky until the drive home (which was at a slow 55mph because of the spare tire I was driving with). The fussiness continued all afternoon. If she wasn't whining, she was crying. Her tummy was bothering her again. I don't know what we're going to do about that. We're already giving her Miralax on a daily basis. She was also having lots of seizures. I did finally get a call back from the neuro nurse today who said that we can just lower the vigabatrin dose back down to 750mg 2x day...no need to wean. Then tonight she was finally in a better mood and it hit her. A big giant seizure. I have often wondered if the tonic seizures she had were really tonic-clonic seizures (or grand mals). There was little doubt that this was in fact a grand mal. She went stiff for a minute or so and then came out of it with constant twitches/spasms for another minute or two. She was dazed and out of it for a while afterward. Yuck. I'm so sick of seizures! Why can't this baby catch a break?!?!? I just want something, anything to work for her. I'm going to put in a call to her neurologist tomorrow. It's time to try something new. I'll let you know. Meanwhile, please keep her in your prayers. She needs a better day tomorrow...we all need a better day. Reagan had a good night's sleep last night and woke up in a great mood this morning. Everything went smoothly with the cataract surgery to her left eye (thank you for the prayers). The doctor said there weren't any problems whatsoever with the surgery, although during the exam of the right eye she did notice some cloudiness that may need to be addressed at a later date (but hopefully not). Reagan even woke from anesthesia with little more than a whimper, a stark difference from the last surgery where she was crying hysterically for over an hour. All in all she's been great today, a little tired but that's understandable considering all she's been through. The patch seems to be only a minor irritation to her. She hasn't really tried to grab it, but she has tried try to rub it off on my shoulder a few times. We go in tomorrow morning and they remove the patch, inspect her eye, and we begin the hourly regimen of eye drops. On a positive note, she has become quite the good sport with having eye drops put in her eyes (I guess the 2 weeks of drops with her last surgery did the trick). Seizures have been a little hairy today. She had a small tonic this afternoon...poor girl, can't get away from these things. I put a call in to her doctor (and spoke with the nurse this morning) but still haven't heard back on the exact directions for decreasing the vigabatrin. I just want to do something, because this isn't working. Please continue to keep her in your prayers...for relief from these stinking seizures and for quick and perfect healing of her eye and improved vision! Today has been a little chaotic. We went in this morning to the PMR appt for what was basically just a second opinion. The doctor was very nice and she said that we are doing everything we need to be doing (which is reassuring). She definitely agrees on the Botox (she said Reagan is VERY tight) and she wants her to get an x-ray of her hips because of the constant popping. She said that it's probably fine (since she doesn't seem to be in pain) and sometimes for whatever reason these kids don't have properly formed sockets in their hips and the bone doesn't fit securely in the socket allowing it to slip out and "pop". She actually wanted us to get the x-ray today, but there was a huge wait and we had to get back home for another appt. So we rush home to get back in time for the appt and the guy is over an hour late. I'm sorry, but I just have NO patience for such nonsense. I make a point of being on time to every single appt I go to (and I have a totally dependent child I have to drag around with me)...I expect the same courtesy (although I seldom get it). We did go for a late afternoon PT visit (her therapist stayed late just to see Reagan). It went really well. Reagan had just had a nap and woke up energized and ready to work. Her PT was very impressed and thinks she definitely sees improvements related to the HBOT. Reagan was really kicking her legs around a lot (something she's been doing lately), so her therapist put her in a walker and she was actually stepping. It was too cute! But the biggest news of the day is that the cataract surgery is still on. They called this morning to confirm, so we need to be there by 7:30am for her 9:30am surgery. I know it's a good thing because I remember how much her vision improved after the first cataract surgery, but I'm still very nervous. Please keep her in your prayers for a flawless surgery and a quick recovery. Last night was bliss. Reagan slept like a dream and so did we (in our own bed). Reagan has been in a great mood again today. Although she is having way more seizures than I'd like. I'm not sure what's going on. I don't really think the diet was helping her, but we have seen an increase since she's been off. Maybe she's metabolizing her medicine differently since being off the diet and that's causing an increase in seizures. Who knows. I'm of the opinion to decrease the vigabatrin back down to the lower dose that seemed to be doing the best job. I tried to call her doctor on Friday to ask him how we need to go about doing that, but I was unable to get a hold of anyone (they put the calls through to voice mail early). So I went ahead and started (slowly) decreasing it...just the nighttime dose and just a slight decrease. Hopefully I'll be able to speak to her doctor about it tomorrow. We've got a full week this week. Tomorrow she's got an appt with the Physical Medicine & Rehabilitation Clinic at Texas Children's. It's an appt I made 5+ months ago. Since then we managed to get her in sooner with another highly respected PMR doctor, who prescribed the AFOs and recommended Botox. I had actually completely forgotten about this appt and when they called to confirm, I almost cancelled. But I thought maybe it would be good to go in and get another opinion to make sure we are doing any and everything in Reagan's best interest. As far as we know she's still scheduled for cataract surgery Tuesday morning. They'll call us to confirm tomorrow that her surgeon is going to be back in town (I'm guessing she left for the hurricane and just hasn't come back yet). I don't want to put this off, but at the same time I'm nervous about another surgery. Please keep her in your prayers. Today has been a great day. Reagan slept well last night and woke up in a wonderful mood. In fact, she's been in a wonderful mood all day today. We packed up our stuff (filling our car to the limit) and left for Houston around noon. Reagan slept about 2/3 of the trip which is always a good thing. It's nice to be home (although I'm afraid I might be unpacking for weeks). Bear was happy to see us (that will last until Reagan's first crying fit). And probably the most happy to see us was my Mom. Ok, so she didn't care about seeing us, but she was overjoyed to see Reagan. It was so cute because Reagan just lit up when she saw her Grandma. This is definitely a Grandma's girl. It's nice to be back home, it's hard to imagine we've been gone for an entire month! I can hardly wait to sleep in my own bed tonight, although it may be a while because Reagan is still wide awake and talking up a storm. Thanks for the prayers, we made it home safely and it's been a great day for us all. Well here we are on our last day of HBOT. Reagan was a stinker today. Lots of crying all morning, but she seemed to feel much better following her afternoon nap. Our 20 sessions were cut a little short because of that session we missed on Labor day...so 19 it is. It's tough to say if I've seen improvement (being around her 24/7 and also the harshest critic). For the first 3 weeks probably not, but this last week maybe. She has been very energetic and active this week, although I don't know if energetic is what I need when she's as fussy as she's been. She also seems to be moving her hands/arms around more than usual. I'm still curious to see if her therapists notice any improvements. We'll see. I think the potential benefits of HBOT are mind boggling and awesome but in the end it really depends on the child's specific case and if there was in fact some sort of oxygen deprevation or brain injury. With Reagan (and most of these kiddos with seizures) we still have no idea what led to these problems...all tests are normal. I think the benefits of HBOT far outweigh the risks/cost...if it works, it can work wonders and that is SO worth it. But as with any of these therapies or medications you are left with uncertainty...would it have worked better if we had done more? Who knows. Maybe? 40 sessions is the typical minimum durtation of treatment, but it just wasn't a feasible option for us to be away from home for 2 months straight. One month was too long. And so tomorrow we pack up and head back home. To my house, my husband, my dog, my bed...I can hardly wait! I do want to say a special thank you to my Dad and my stepmother Karen for allowing us to stay with them (and in their large master bedroom suite) for 4 weeks. I know it's been a huge inconvenience for them but we are very greatful...we certainly couldn't have done this without their generosity. Please keep us in your prayers as we head home tomorrow...home sweet home! Reagan slept really well last night, from 9pm-7am, which was great for both of us. When she goes to bed early like that I never know if she's down for good or if she's going to wake up in an hour ready to go. Luckily she was down for the night. I have been having some serious issues trying to get Reagan's seizure medication. The vigabatrin that she's been taking were pills that were given to us by some very generous families we met online whose children did not benefit from this medication and therefore no longer needed it. So up until now I haven't had to deal with the hassle of getting it myself. It's not available in the US, so it's not covered by insurance (all out of pocket) and you have to order it through a pharmacy in Canada and have it shipped, which is easier said than done. Especially when you live in an area that was just hit by a hurricane. Yes, I'm an idiot. I thought I had enough to hold us through the end of this week (I was wrong, I miscounted) and just figured I would have it delivered to Mike's work and he could bring it with him this weekend. Bad choice. Apparently FedEx isn't fully operational just yet and our 2 day delivery has turned into 4 day delivery (assuming we get it tomorrow). All I can say is thank God Meghan had just ordered some more for Jackson and was able to loan us enough until we get Reagan's. FedEx is supposed to be rerouting it to Austin and hopefully we'll have it by tomorrow. Reagan was happy most of the day today until this afternoon her tummy pains started up again. We're talking severe pains that go on for hours, screaming so much she gets red from head to toe and becomes drenched in sweat from all of the energy she exerts. She did feel better after she finally (and painstakingly) relieved herself. Poor baby. I can't wait for her GI appt in October. Unfortunately it's mid October...I just hope this new doctor can get to the bottom of her problems. Seizures were about the same today, still not good. Some of them are painful to watch, they take the breath out of her they're so forceful. I'm really hoping they'll ease up and taper off soon. Please continue to keep her in your prayers. I don't know why but I'm feeling quite melancholy today. Well, maybe I do know why. Life is taking a toll on me. Reagan was up last night from 2-4am with tummy problems...meaning lots of crying...from both of us. It's so hard when she gets like that, there's just no way to console her, these are the times when it's really nice to have someone to hand her off to and just take a breather. It's when you're up like that, in the wee hours of the morning in crisis mode, when frustration gets the best of you (of me) and I get angry with the hand we've been dealt. I know we have a lot to be thankful for, believe me I know. But I want more for Reagan. We've just been in a holding pattern for so long (over a year now), I just want to see something...some sort of progress for my girl! 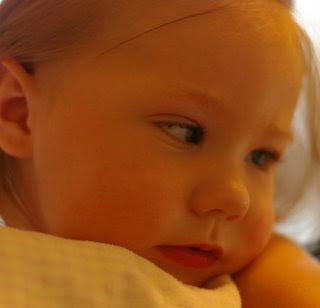 And as frustrating as it is, I'm afraid it all hinges on us being able to get control of her seizures. So it's more guessing, more changes, more medications. I apologize because somehow I've gotten off topic. Other than the episode this morning and another this afternoon (both tummy related), Reagan has been in a pretty good mood today. She was great during her HBOT session, super energetic and happy. She seems to be taking to the solids pretty well. Mechanically she's not that proficient and still ends up with a lot of it on her face and down her neck, but she doesn't seem to have any issues with the taste or texture of it which is a good thing. Seizures have been a little worse, not necessarily in number but in intensity. She's also having 2-3 right on top of each other, instead of one here and there. No idea if it's at all related to coming off the diet (maybe just change in general), but I think I'd still like to try going back down on her vigabatrin dose (to 750mg 2x day) to see if she improves. We'll see. That's something we need to talk to her neurologist about. We also need to see about getting another EEG done. I'm excited about getting back home to my house and my husband, but I'm not looking forward to the constant stream of doctors appts that fills our days. 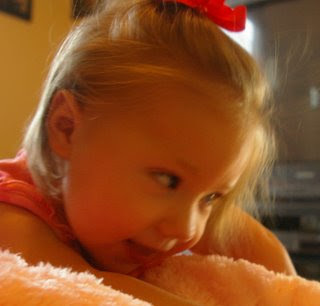 Please continue to keep Reagan in your prayers...for happier days...without seizures. Today has been a much better day for everyone. I have to admit, I was quite upset with what happened yesterday, but today was a new day. A better day. Reagan has been in a great mood all day and thank God no more tonics. She did have some seizures that worried me a little, sometimes before a tonic she'll have a few more intense spasms that cluster together and lead to a tonic, but not today. Seriously, thank God. And to top it all off, Mike got home late last night to find that we DO have power at our house! Thank you everyone for your prayers and please keep them coming...this precious little girl deserves a break from all of this. Today has been a tough one. Reagan went into her HBOT session today fast asleep, then woke up about 15min into it screaming. A few minutes later I realized (by the smell) that she must be having tummy pains. She continued to be upset for the remainder of the session. Let me tell you, it's no fun being trapped in a confined space with an inconsolable baby with a very stinky diaper!! No fun. Then we went out to lunch with Meghan and her husband and Reagan continued to fuss and whine. The key was just keeping a bottle jammed in her mouth at all times. When we would take it out, she would let loose! She was quite the stinker! And then this afternoon Mike managed to slip away for a round of golf, Reagan woke from a long nap and had a big nasty tonic seizure. Have I mentioned how much I hate those?!?!? She got all stiff and kind of twisted at the waist, her arms, legs, and even face were just frozen in place. She was completely vacant and it took her a while to snap out of it. Even after she lost the tone, she had tons of little seizures all clustered up that kept her in a dazed state. Then she continued having little ones (more than usual) for the next several hours. It's been months since she had a tonic seizure...I was sure hoping those were behind us for good. I don't think it had anything to do with getting off the diet, but who knows. We never know. It's just so stressful. I hate it that she has to endure this junk! Then Mike left tonight to go back home (horrible timing), but he had no choice. We still don't have power at our house, but he has to be back to work tomorrow morning so he had to go. Please continue to keep that situation in your prayers, there are many people dealing with damage to their homes and many more without power in the Houston area. We're hoping to head home on Saturday to a house with power!! Also, please, please, please keep Reagan in your prayers. It just breaks my heart to see her having so many horrible seizures. Not much to report today. Reagan is still not really wanting to drink her bottles, but I am still managing to get a fair amount in her. The dietician mentioned last week that we could switch her over to Pediasure if she didn't want the Enfamil Next Step formula. It's a lot sweeter so maybe she would like it better, who knows. I'm going to see how she does over the next week or so and then decide what to do. We did try some baby food yesterday and today, very small amounts of rice cereal w/pears, and she did a pretty good job with it. She wasn't gobbling it down, but she didn't seem to dislike it either. Maybe we'll try something a little sweeter tomorrow. She has always had a sweet tooth (even before she had teeth). Tomorrow is Reagan's 15th HBOT session and the plan is to just stay the rest of the week to give her the full 4 weeks of treatment (no rush to get back to Houston with no electricity). I wouldn't say we're seeing any huge improvements, but there are some subtle things we have seen that are slightly improved (which may or may not be from the HBOT). I'm curious to see if anything in particular stands out to her therapists once we get her back home and in therapy again. As far as HBOT goes, I just want to make sure we do enough sessions to give it a fair shot at working. It definitely works wonders for some kids...I was just hoping that Reagan might be one of them. There's still time. Please continue to keep her in your prayers! Good news...Mike (and Bear) braved Hurricane Ike in the wee hours of the morning and came out unscathed. So did our house. We were lucky...thank you for your prayers. Our neighborhood drains very well, so we have never even come close to flooding, which is a common problem with most hurricanes. But many of our neighbors had some sort of damage, whether it be a broken window, shingles missing from their roof, or part of their fence missing...most of it was minor damage. Other than our trees and plants taking quite a beating, we have no real damage to report. And the power outage. It seems nearly all of Houston and the surrounding areas are completely without power. Who knows how long this will last. Hopefully not long. With no power and no need for damage control, Mike decided to go ahead and come up to Austin this afternoon. Reagan was a little whiny all morning, but after a good nap and being reunited with her Daddy, she was much happier tonight. We're all going to sleep more soundly tonight. Sweet Dreams. Reagan has been in such a great mood today. She was great for her HBOT session, kicking around and super active the whole time. Her Aunt Amber (my younger sister) evacuated Houston because of the hurricane and stopped by to see us today. Well, she really came to see Reagan and not me, lets be honest. But Reagan was sooooooooo happy to see her!! She was smiling a mile wide...it was the cutest thing ever (unfortunately my picture didn't capture just exactly how happy she was)! She definitely loves her Aunt Amber and has been missing her and her Grandma while we've been away (although they have been calling and talking to her over the phone daily...it just isn't the same). Reagan has gotten in the habit of staying up late again, which is a killer. The last few nights she's not even looking tired at 11:30pm...I just finally give in and lay her in her swing and let her drift off to sleep on her own (which thankfully she has done). Tonight she's following the same suit. Here it is 11:30pm and she's still wide awake and kicking! What can I do? At least she's in a great mood! Mike is still holding his own against Hurricane Ike. He lost power for good around 8pm, but his cell phone is still working (thank God), so I've been able to check on him. The eye of the storm is supposed to make landfall around 2am, so please continue to keep him in your prayers! He's just disappointed that it's going to happen at night, he'll miss all of the excitement. Well, that's my hope anyway. 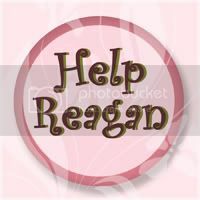 Keep Reagan in your prayers this weekend as well. She's had her share of seizures today and I would sure love to see some improvement in that area soon! Today is lucky number 13 in Reagan's HBOT sessions (and 9/11...go figure). Reagan has been in a pretty good mood all day today, which is always a bonus. Unfortunately, the seizures were definitely increased from yesterday. And she's been weirdly tensed up today. I'm not sure what that is about. Hands super clenched, going into extension a lot, kind of strange. She's also not wanting to drink her bottles. Usually she'll get lazy and just let it drip into her mouth not wanting to exert the energy to actively drink it, but today she's not even wanting to swallow. She'll let it pool up in her mouth and then it will either come flooding out or she'll choke on it. She's been doing that all afternoon. Makes it difficult to get her to eat. She's also choking on her spit a lot. I'm not sure if it's something to do with her swallow reflex (and seizure related) or what. I did check her urine today and it seems that she's finally out of ketosis. Which is good, we can move on and begin feeding her solids again (as soon as I get to the store to buy some). Our plans for this weekend are going to be thrown off a little with Hurricane Ike headed directly for Houston. Mike refuses to leave (because with Rita we were stuck in the hellish evacuation traffic) and insists that he's just going to stay put and ride it out. Please keep him in your prayers. We don't need any added stress to our lives! Today has been a strange day. Reagan slept well last night but woke up early at 6am this morning. At first glance she appeared to be in a good mood, but the good mood faded in no time and progressed into the psycho hyperactive baby bit, which quickly turned into the screaming crying nonstop bit. She cried for about 3hrs straight before HBOT, thankfully wearing herself out and falling asleep right before going into the chamber. She slept the entire session and then woke up screaming again for another 2.5hrs. We stopped by and had lunch with Meghan and Jackson after therapy but left early because I felt bad about all of the crying. It finally ended about 10min before getting back to the house and culminated with a very full diaper. I definitely think it's just her tummy adjusting to the new formula combination. Poor girl. The funny thing is she's been so good lately...she's strung together quite a few wonderful happy days...but on days like today it's hard to remember the good and all you want is for it to just STOP. After she went potty and took a decent nap, she certainly seems to be feeling better tonight. 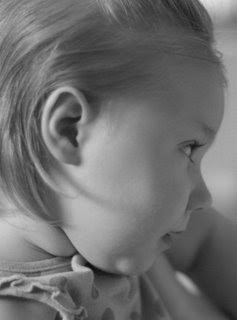 It's strange because now that I think about it, this morning when she was so upset with the nonstop crying, she had very few seizures (and the morning is usually when they are at their worst). I'm hoping maybe this is a trend and not just a one time occurrence (the fewer seizures...not the crying). She has so many new things going on right now...wouldn't it be awesome for one of them to work for her?!?! Please keep her in your prayers. With God all things are possible! Today has been an uneventful day (which is good in many aspects). Reagan has been sleepy most of the day. Which is strange because she slept well last night, waking up once or twice with a little cry but then going back to sleep on her own and not getting up for good until around 8:30am. But then she still took a good nap this morning before HBOT and then another super long nap this afternoon after HBOT. I'm not sure what all the sleepiness is about. She hasn't had a lot to eat today, partially because she's been sleeping so much and partially because she doesn't seem to like this new concoction of formula I'm trying to feed her. I don't blame her. The previous batch was loaded with sugar, so I'm sure the new version isn't nearly as tasty. Maybe that's affecting her energy too...who knows? She didn't seem to notice the change in pressure in her HBOT session today. The only thing I noticed is that it takes a little longer to compress and decompress, which just means more time spent in the chamber. 1.5ATA is the standard pressure typically used in treating kiddos for things like autism and cerebral palsy (they are just a little more cautious with kids with seizures and like to slowly acclimate them to the pressure). I'm hoping that we'll really start seeing some improvements in her at this new pressure. Please continue to keep Reagan in your prayers...we're expecting miracles! So today was another good one for Reagan. She was a little sleepy most of the day (despite sleeping through the night last night) but then really kicked it into high gear tonight! She was having quite a few seizures, not the big ones but more the twitchy nonstop kind (that aren't supposed to be epileptic) but they were still leaving her kind of out of it. This went on for an hour or two and then all of a sudden they stopped and she became crazy baby!! Out of no where she just started babbling and sqealing like a maniac! I know I've mentioned her doing this before, but this is the first time my Dad has seen her do first hand and I think it caught him a little off guard. It's hard to explain...she's happy, but a little crazy at the same time (like any moment it could all turn and she'd be screaming/crying). She kept this up for quite a while (much longer than you would think possible) and then finally she wore herself out and fell asleep. I'm not sure what this means for tonight. She may sleep all night through or she may wake up in a few hours as crazy as before?!?! We'll see. We've got a few changes cooked up for tomorrow. We're changing the formula again. This will be a 0.7:1 ratio...it's 1/4 Ketocal, 3/4 Enfamil Next Step formula (what she was on before starting the ketogenic diet). Last I checked she was still in moderate ketosis. I'm beginning to wonder if she's ever going to come out of it!?!? We're also going to up the pressure on the HBOT. She's been at 1.35ATA and we're going to increase it to 1.5ATA tomorrow. Lots of changes for this little one...so please keep her in your prayers! Reagan had another good day today...for the most part. She slept well last night, waking up early this morning, but she was happy and that's all that matters. She stayed happy most of the day until late afternoon. It was the return of the tummy pains. She woke up from a short nap very upset. Crying lots of real tears. I think it was a combination of gas pains and sleepiness (she never took a decent nap). Finally I was able to get her semi-consoled and she reluctantly drifted off to sleep for what turned out to be her best nap of the day. She woke up feeling better and we all breathed a sigh of relief. We've got HBOT tomorrow morning and then Mike heads back to Houston for the work week. I just want to thank everyone for the constant prayers for our little one...it sure paid off this weekend, it was obvious she felt better than she has in a long time!! Keep them coming!! She did it today...Reagan finally broke the cycle of one good day, one bad day!!! Today was another great day (depsite being up in the middle of the night last night). She has been super sweet and laid back all day long. It's funny because when she's good...she's sooooooo good. And when she's bad...she's sooooooo bad!! There's not much in between for this girl. I'm glad to see that the formula changes don't seem to be affecting her at all. Although I'm not sure if she's coming out of ketosis just yet. Even the dietician seemed suprised that Reagan could stay in ketosis at such a low ratio of the diet. We didn't do much today...just hung around the house while Mike played golf with my Dad and Bear went in for the works at Petsmart (he needed to freshen up a little). It was a nice relaxing Saturday...just what the doctor ordered! It was a good day today. Reagan slept through the night last night and woke up in a wonderful mood. Her HBOT session went smoothly and she came out just as happy as she went in. I lowered the ratio of the diet today from 1.5:1 to 1:1 (basically just adding even more sugar and protein to the mix). She doesn't seem to notice. I'm hoping her tummy won't notice either. I'm pretty excited about getting her back on solids (and interested to see what she thinks of them now that she's been off for 4months). I'm guessing she'll like the addition of some flavor to her diet. 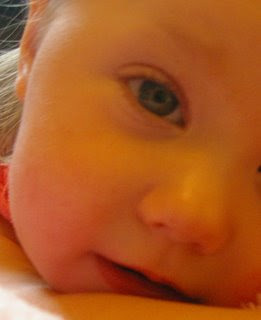 We've still got about a week or so before we have her completely off and can begin giving her solids again. We'll see...should be interesting. Mike's on his way and he and Bear (yes, he's bringing the dog) should be here in a couple hours. He's already got a tee time lined up tomorrow, so it seems like my dream of getting some help this weekend may in fact be just that...a dream. I don't really mind as long as Reagan's in a good mood (so hopefully she'll break the pattern and have a good day tomorrow instead of her scheduled bad day). Please continue to keep her in your prayers. I'm really hoping to see some improvements from the HBOT soon! Last night (and the first half of today) was another stinker! Reagan woke up at 2am crying inconsolably. I have to admit, I really wasn't in the mood for it, because she didn't go to bed until after 11pm and I just wanted to sleep. But that was not going to happen. She didn't want to drink her bottle, she didn't want to be held or rocked, nothing would soothe her! Even when I finally got her to go down around 4am, she just laid there moaning. She was NOT a happy camper. Then she was back up at 5:45am inconsolable again. This continued all morning....every waking moment! It was exhausting. I think it's her tummy. It all started when we changed the ratio of the diet last Friday. Since then it's been one HORRIBLE day and then one good day. I think her tummy is rejecting all the sugar we're having to add to the ketocal to reduce the ratio of the diet. She had 3 movements within 24hrs which is totally out of character for her (she usually goes once every 3-5 days...sorry)! I spoke to the dietician today about it and she said lets just continue the wean (starting a 1:1 ratio tomorrow) and get her off the diet completely by next week. So that's the plan (she's still at the highest level of ketosis, so we're hoping that the 1:1 ratio will finally bring her out of it). It may not sit well with her (literally), but the sooner we get her back to regular food/formula, the better. She was so bad this morning that I even briefly considered skipping HBOT, but that's the whole reason we're here and if she can scream outside the chamber, she can scream inside the chamber. Luckily, I was able to get her calmed down and fairly content once inside. But there was nothing I could do for the seizures. She was having a lot of them. She woke up from a nap right before we left for HBOT (which is when the seizures tend to rear their ugly head) and then had a ton of them on the way there and in the chamber. Afterwards, she seemed much better (although a little dazed). I don't know if the treatment helped her or if she was just finally done but she was a whole new baby the rest of the day. Thank God because I needed a break! At least Mike will be here this weekend. He'll be driving back after work tomorrow so please keep him in your prayers as he heads this direction. And please continue to pray for our little princess...that her tummy pains will go away, her seizures will decrease, and the HBOT will do it's job! Amen. Today was a much better day. Do you see the pattern? I hope this one good day, one bad day thing ends soon because it sure is exhausting! Anyway, Reagan slept through the night last night and woke up this morning just as sweet as she could be! She's been that way all day today. We went before HBOT and had lunch with Meghan and her family and both Reagan and Jackson were very well behaved. Then Reagan slept through her entire HBOT session...a first for her. It was nice and relaxing. We increased the pressure today (they wanted to increase it yesterday but I didn't think that was a good idea considering what a foul mood she was in). They started her out at 1.25ATA and today they moved it up to 1.35ATA. I didn't notice anything different except it just took a little longer to decompress than usual. We'll see. 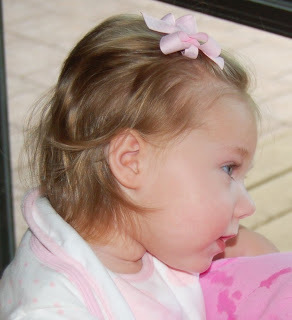 I was experimenting with her hair today...pigtails...pretty cute but a pain to keep in! Reagan was a turkey again last night. She didn't go down until around midnight, which used to not be out of the ordinary for her, but lately she's been so good about going to sleep early...we've gotten quite spoiled. Then she woke up at 4am wide awake and talking up a storm. She was just so happy, I couldn't be mad at her! But sleep got the best of me, and about 45min later I put her in her swing and she talked herself to sleep. And other than the crazy night's sleep, she's been super easy and a total sweetheart today! We ate breakfast this morning at my favorite Austin breakfast spot Kirby Lane and Reagan was just so well behaved (even with the hour wait)! Mike headed back to Houston this afternoon...we'll definitely miss him, but he'll be coming back on Friday so that's good. Tomorrow it's back to HBOT. They've got 2 machines now so we're going to do Reagan's session at the same time as Jackson's (assuming his ear is better). It's so nice having someone here to talk to as we go through all of this. It has been such a blessing...the wonderful and supportive people we've met along the way and Meghan is no exception. Despite both of us being from Houston, we spent most of our time on the phone and only met in person once before coming to Austin. So although it's rough being away from home and our husbands, it's nice that we're able to get together while we're here and offer support. Please keep Reagan in your prayers for a great week with wonderful results from the HBOT!